Next Monday, 12 December 2016, marks the 150th Anniversary of the firing of Oaks Colliery, when 383 Barnsley men and boys lost their lives. You can find out more about the planned commemorations on the Dearne Valley Landscape Partnership (DVLP) website. We plan to attend the Memorial Service on Sunday 11 December at the Barnsley Main site and place three wooden crosses to the OH's known relatives. With so many names to research the DVLP recruited volunteers from across Barnsley to investigate each one and to eliminate duplicates from a master spreadsheet compiled from the death certificates and the various historical printed lists which have been made available online on a dedicated Oaks Colliery 1866 Disaster website. I was pleased to be one of these volunteers for a short while, although I only researched a handful of names, being rather busy with Barnsley War Memorials Project work in the run up to the Somme Commemoration. I know that other volunteers researched hundreds of names over the autumn of 2015 and into early 2016 (including those of the OH's relatives) as the names were handed out in alphabetical chunks for fairness and lack of bias. A searchable online list of all the names identified and researched can found on the DVLP website. I had known that Matthew Scales and other members of his family had been killed that day for many years, but as they are a distant connection of the OH's I had not researched them particularly deeply. 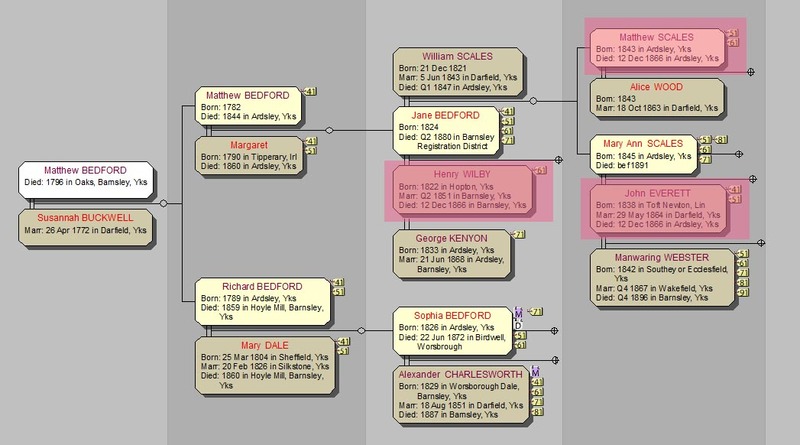 Looking at the family tree snip above you will see on the far left Matthew Bedford who died in 1796 at "Oaks, Barnsley". He is the OH's 6x great grandfather. He had at least four children that I know of, including the two sons shown here, Matthew b.1782 and Richard b.1789. Richard is the OH's 5x great grandfather and his daughter Sophia, b.1826 who married Alexander Charlesworth in 1851, is the OH's 4x great grandmother. For clarity I have not shown all the children of each generation. 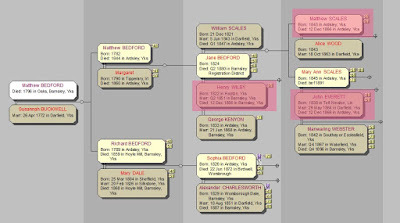 Sophia's first cousin Jane Bedford b.1824 lost a husband, Henry Wilby, a son, Matthew Scales, and a son-in-law, John Everett on that dreadful day 12 December 1866. Given the family's close connection to the area the OH may well have other connections to the men lost that day, but these are the ones I am currently aware of. Jane Bedford married William Scales on 5 June 1843 in All Saints church at Darfield. She was just 20 years old, he was a 23 year old Coal Miner and they both lived at Ardsley. Bride, groom and both witnesses marked the register with their crosses as they were unable to sign their own names. Jane and William went on to have two children, Matthew b.1843 and Mary Ann b.1845. Sadly William Scales died in March 1847 aged 26 and is buried at Christchurch, Ardsley. Having been left with two small children to look after it is not surprising that Jane remarried within a few years. Her second husband was Henry Wilby, a 28 year old Labourer from Hopton in Yorkshire (which I think is near Mirfield). Jane is now 27 years old. At their marriage at St Mary's church in Worsborough Village in June 1851 both parties give their address as Stairfoot, neither bride nor groom could sign their names, but the two witnesses could. Jane and Henry had six children, but only three (William b.1855, Henry b.1858, and Tom b.1864) were still alive when Henry Wilby snr was killed in the Oaks Colliery Disaster on 12 December 1866 aged 46. He was buried at Christchurch, Ardsley on 23 December 1866. His home address is given on the DVLP list as 2 Common Side, Ardsley. Jane's third marriage was to George Kenyon in 1868 at Christchurch, Ardsley. She was now 44 years old, George was a 33 year old widowed tailor from Ardsley. As far as I am aware Jane had no further children. 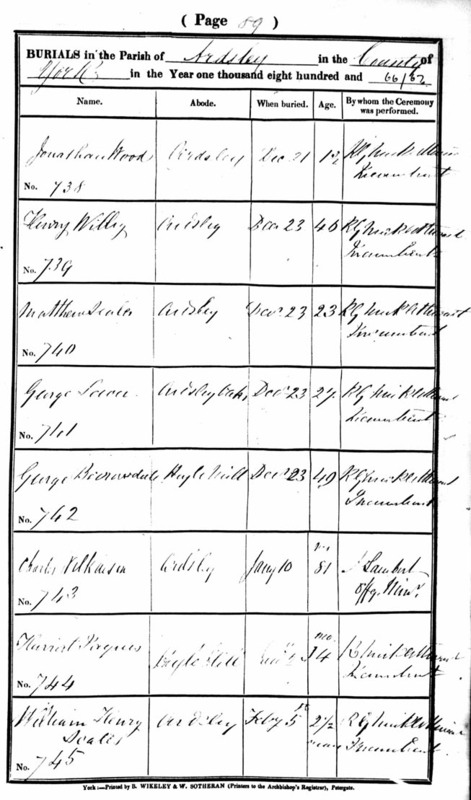 In the 1871 census George and Jane are living next door to the Black Bull pub at Stairfoot with Jane's youngest son, Tom Wilby, aged 7 living with them, Henry jnr had died in 1869 aged 11. Jane died in June 1880 aged 55 and is buried in Monk Bretton churchyard (the cemetery did not open until 1886). George Kenyon married again in December 1880. Jane Bedford had a hard and relatively short life. She buried two husbands, five children and a granddaughter (an illegitimate child of her daughter Mary Ann Scales, born and died in 1863), but she did live to see her daughter remarry and would have enjoyed a number of other Everett, Webster and Wilby grandchildren. Jane Bedford's son, Matthew Scales, b.1843, married Alice Wood on 18 October 1863 in All Saints, Darfield. He was a 19 year old Collier and she was 20. 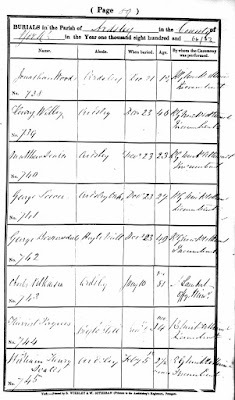 Matthew did sign his name on the marriage register as did their two witnesses, Alice had to mark a X. Matthew and Alice had two children, William Henry b.1864 (named for his grandfather and step grandfather maybe?) and Fred b.1866. Matthew Scales was killed in the Oaks Colliery Disaster on 12 December 1866 and was buried at Christchurch, Ardsley on 23 December 1866. His home address is also given as 2 Common Side, Ardsley in the DVLP listing. He was just 23 years old. He was the OH's second cousin 5x removed. His name appears in the burial register immediately after his step-father Henry Wilby. Sadly young William Henry Scales did not long survive his father, dying in February 1867 aged just 2 and a half, his burial is listed at the foot of the same page on which his father and step-grandfather's names appear. At least 35 men who lost their lives in the Oaks Colliery Disaster of 1866 are buried in the churchyard at Ardsley, where there is also a memorial to all the men (here's a link to a photo and an enlargement of the inscription on Geograph). Jane Bedford's daughter, Mary Ann Scales, b.1845, married John Everett on 29 May 1864 in All Saints, Darfield. He was a 25 year old Plate Layer (a railway worker) from Toft Newton in Lincolnshire. She was 20 years old. John could sign his name, Mary Ann could not and they both lived at Ardsley. They had one child, John Henry Everett b.1865. When he was baptised at St Mary's in Barnsley on 14 December 1865 the family were living in Barnsley. 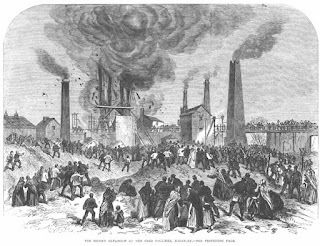 John Everett was killed in the Oaks Colliery Disaster on 12 December 1866 aged 29. He was buried on 16 December 1866 at Christchurch, Ardsley. The DVLP online listing gives his home address as Union Street, Barnsley which was in the parish of St John the Baptist (in the Barebones area near the town centre). Mary Ann Everett, widowed at 22 years of age with a one year old child, remarried on 7 Nov 1867 to Manwaring Webster at All Saints, Wakefield (now the Cathedral). He was a 22 year old Butcher, born in Southey Green or Ecclesfield in Sheffield. Both parties say they were living in Westgate in Wakefield when they married and state that they are 'of full age' rather than being specific about their ages. Mary Ann and Manwaring had moved to Monk Bretton by the 1871 census and they have at least four children that I have found. There must be many more direct descendants of these three men alive today, but in their absence the OH and I will be honoured to lay our wooden crosses in their memory next Sunday morning.